This ferrata combines a very, very easy approach (which is via cablecar) with a moderately long and moderately strenuous ferrata. There is basically no approach walk. as of summer 2016, the upper cablecar approach to this ferrata has been shut down due to its old age. not sure if it will reopen The route is quite high in altitude (above 3000m / 10,000 feet), and traverses a wild, rugged ridge to one of the summits of the Cristallo group. Because of its easy approach, likely there will be traffic. With the shutting down of the upper cablecar approach, this is likely to be much quieter now. However, you must hike up steep scree from the top of the lower Rio Gere chairlift. About halfway along highway S48 between Cortina D'Ampezzo and the junction between S48 and S48b, you'll find a cablecar station. This cablecar will take you up, in two stages, to the rifugio Lorenzi Now only one stage, and you must hike up the second section. The rifugio is situated right on the crest of the main ridge of the Cristallo group, and it is itself at a very high altitude. Beware - the second stage of the lift is very old and has these weird little old brightly colored 2-person pods. You can barely stuff two people in them! At the top of the very steep second lift, you are only two or three minutes walk up to the Rifugio Lorenzi, perched precariously on the ridge. Heading inside for a nice spot of tea before embarking on the ferrata is an attractive idea. If you sit at the south-east corner of the dining room, you can look out of the window at the start of the ferrata, right off the edge of the rifugio's deck. The ferrata is not particularly steep, at least not at first. It winds its way over and around and in between all sorts of cool towers along the ridgecrest. Basically, the route stays along the ridgecrest all the way to the summit of the Middle Cristallo (which is your destination). There are a few ladders here and there, and a few somewhat airy spots, but nothing overtly bad. 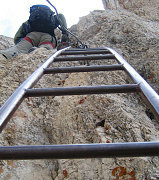 It is a moderately long stretch of ferrata, though, so be prepared to be climbing for a while. The summit of the middle Cristallo, once you reach it, has a stout cross and an excellent view down into the valley containing Cortina D'ampezzo. As you would expect, there are excellent views in all directions, really. Of note is the small glacier remnants on cirques on the north side of the Cristallo. There is no option but to downclimb the way you came (another reason why this can be fairly long compared to other ferrata sections). As you descend, you can see the rifugio perched on the ridge far below. The two-way nature of this ferrata also tends to lead to a lot of oncoming traffic. Once back at the rifugio, your efforts are over, since it is now all cablecar back down to the carpark.